SERVING INDIANA, MICHIGAN, AND NORTHWEST OHIO • CALL US TODAY AT 800-890-0678 or 574-273-9277 • Family Owned Since 1992! 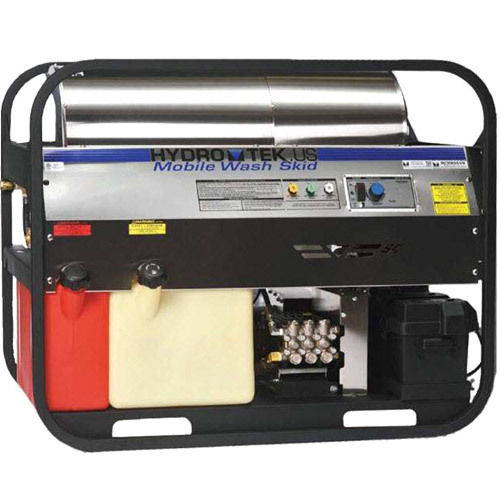 The Hydro Tek SC Series Hot Water Pressure Washer is Gas Powered & Diesel Heated. The SC Series Mobile Wash Skids are Self-Contained pressure washers that are Gas Powered & Diesel Heated with Powder coated or stainless steel for durability. Hydro Tek’s unique “Pro-tect-it” frame of 1¼”, heavy gauge steel, with durable electrostatically applied powder coat finish. Tie down brackets / 4-point lifting eyes as well as hose reel mounting holes incorporated into the frame. These rugged and durable panels offer lifetime corrosion resistance and protection of your valuable investment from the harshest environments. Keeps your machine looking like new for years to come. A 110v oil fired burner is paired with the Hydro Tek manufactured SpiraLast™ heating coil for an efficient heating system. Robotically fused ½” schedule 80 steel pipe is cold rolled to protect the steel pipe from fatigue and the spiral coil is then surrounded by ceramic insulation and stainless enclosure with double-wall end caps. Ask your dealer about the Lifetime Coil Warranty. Efficient OHV gas engines with electric key start, low oil shutdown, and cast iron cylinder for maximum duty and performance. Some models equipped with a durable, water-cooled diesel engine with key-switch shutdown, for enhanced longevity and single fuel source. Heavy Duty “roto-molded” rust free fuel tanks with fuel filter to protect against contaminated fuel. Extended run time (up to 8hrs.) eliminates interruptions. High capacity 8 gallon gas and 18 gallon diesel fuel tank decrease refueling and operator down time. Flow sensitive unloader allows pressure to build up gradually as trigger gun is activated eliminating “pressure spikes” and improving operator control and safety. When the gun is released, entire system pressure is relieved, enhancing system life and eliminating engine starting problems. The unloader is panel mounted eliminating heat failure and vibration. Balanced regulating unloader on 2-gun systems. ETL certified to UL1776 Class 2, for use in wash-down area, exceeding Industry standards. Special Hydro Tek control box features easy to use controls and provides instant access to electronics. Provides automatic, high intensity ignition and reliable power for the heating system. Supplemental power from the generator offer the operator the option to run lights or accessories. V-belt driven pump, low RPM drive – cooler and quieter operation for continuous duty performance. EZ Align™ belt tensioning system allows for easy, single bolt, belt adjustments. Unmatched Durability: The SC is a proven model manufactured and refined for over two decades.